Day 1 (Friday) went pretty well. While the Wife was at work the BM, MOH, and I went to have lunch at the Cold Spring Tavern. The MoH and BM declared it delicious and an awesome place. After our satisfying lunch we did two geocaches - one along Stagecoach Road, not far from the tavern, and another on highway 154 near Lake Cachuma. Both caches were park and grabs and were a good introduction for the MoH and BM to the hobby. Both were rather clever hides. At this point I realized that there was just not enough time to do any more geocaches so we headed over to Lompoc to tour Mission La Purisima. The weather was perfect. Everything was green. We all had a great time. 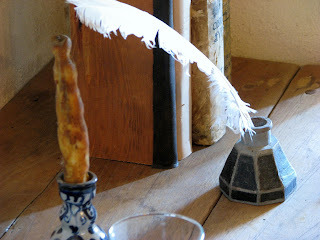 I took a few more pictures and added them to my collection of La Purisima Mission Pictures. We then fought the bad Santa Barbara traffic to get home in time to meet up with the Wife and go to Pirates Grub N Grog. Just about then the bug, which had been pretty much dormant all day, decided to make a come back. It was kind of weird - I felt feverish but I didn't have a fever. I decided to bow out of the high school basketball game and went home to rest instead. I finished off some internet news and Blog reading (Priorities, Priorities) before I drugged myself and got in bed. I managed to finish the book I was reading before turning out the light. Day 2 (Saturday) will be occupied with facials for the ladies followed by shopping in downtown Ventura. A light and easy day. I can't help it... every time I see the initials "BM" I think "bowel movement". Sorry, dad. MH: LOL! I will have to talk to BM about this. A Name change may be in order. GH: It's worth the little detour. I would recommend week days only. On the weekends the crowds are daunting. You have to park so far away that you'll need your hiking gear to get there. Bruce has read 1 book toward his goal of 10 books. Share book reviews and ratings with Bruce, and even join a book club on Goodreads. Book: Thomas Friedman's "The World Is Flat"
ALL MEDIA, UNLESS OTHERWISE STATED, COPYRIGHT 2006 - 2019. DO NOT REPRODUCE IN ANY MEDIA WITHOUT PERMISSION FROM THE AUTHOR.